Hecdakid Inks Publishing Deal With Rapidly growing Digital Brand. Hecdakid is no stranger to the Music Scene. Especially When You dig Deep into his Resume of Activity across a five year span. Once you pull back the many layers of his unmatched work ethic you will see HecDaKid has opened for Guerilla Black, Bone Thugs and Harmony, Fred the Godson, and a few others. He's also performed for Rapsheet Magazine among the likes of Busta Rhymes & Also Miami’s own Zoe Pound. Fast Forward to the present Hecdakid's work ethic has brought us some very noteable sounds. Starting this musical Journey in Greenbay, WI Hecdakid linked up with the Local Producer Dj Soul from Milwaukee. Separated by circumstances out of both of their control destiny linked them back up in Atlanta where they both presumably relocated. 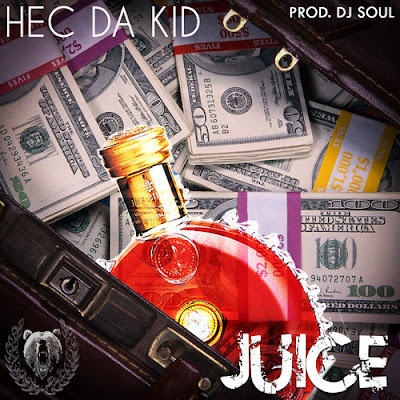 The Reconnection with Dj Soul shows the apparent synergy they once had in Milwaukee with Hecdakids Latest Single "Juice". The Atlanta relocation proved successful when through mutual connections from out of Kansas linked him up with O.M.G Entertainment, inc. After a year of calls, business and relationship building Hecdakid is finally on his way with a Publishing Deal with O.M.G’s Publishing arm Tha Grizz Publishing Corp. Its looking to be one hot summer as we anticipate an EP which has not been given a name or date as of yet. As we patiently await this inaugural project Check out his latest single Juice.